Celebrate National Sausage Week with our sin-free sausage casserole recipe! 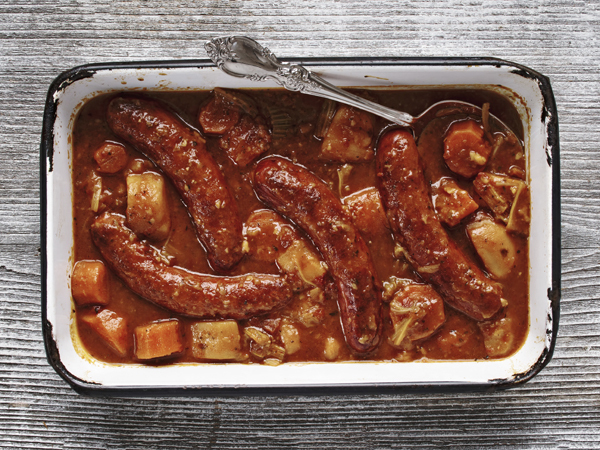 A warming sausage casserole makes for a wonderful winter treat. Our tasty sin-free sausage casserole is ready in 40 minutes, so you can enjoy a guilt-free mid-week that the whole family will love! 1. Heat 1 tablespoon of the oil in a large saucepan and fry the sausage chunks until evenly browned. Remove from the pan and set aside. 2. Mix the remaining oil with the onions in the pan and cook over a high heat, stirring occasionally, for 5 minutes or until the onions are golden. 3. Pour in the tomatoes, stirring in the bits from the bottom of the pan, then add the tomato purée. Fill the can up with water twice and pour the water into the pan. Sprinkle in the bouillon powder, paprika and sugar and salt and pepper to taste. Stir well and bring to the boil.